Outside My Window… it’s sunny and cold. The streets are narrow and slushy with large snowbanks. I am thinking… that I really should clean out the fridge. Too bad I didn’t think of this before buying all my holiday groceries. I am thankful for… the fact that Z is feeling better today after tearing some ligaments in his shoulder on the ski slopes yesterday. From the kitchen... I need to get going on some Christmas baking before we have family over Christmas Eve. I am wearing… Black turleneck sweater, black jeans, black socks, pale blue slippers. I am creating… some calm in the house. I am going…to fold the last loads of laundry before Christmas. I am reading…Exiles by Ron Hansen. I am hoping…for a relaxing, blessed Christmas. I am hearing… the dishwasher draining and the sound of my son discussing the eggs he made for lunch with his father. Around the house… I’ve got a couple of gifts left to buy and a few more to wrap. One of my favorite things... is hearing my teenage sons talking together without fighting about anything. A Few Plans For The Rest Of The Week: I have a massage booked for tomorrow. On Christmas Eve, we are hosting Z’s cousin and family. They are hosting us Christmas Day. I will be singing in the choir at Midnight Mass and then at the 11:30 Christmas Day mass. We have tentative plans to visit family and friends in Ottawa between Christmas and New Years but it will depend on how Z’s shoulder is feeling and when his appointment with the orthopedic surgeon gets booked. 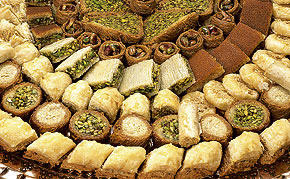 My dear husband keeps bringing baklawa home from the Lebanese bakery and I cannot control myself around it.